Thirteen to twenty pairs of somites are present and the embryo is shaped in a modified S curve. 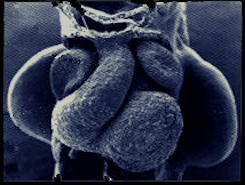 The embryo has a bulb-like tail and a connecting stalk to the developing placenta. throughout the body, begins. However, this is not true circulation because blood vesel development is still incomplete. At this stage, the neural tube determines the form of the embryo. Although the primary blood vessels along the central nervous system are now connecting in Stage 11, the central nervous system appears to be the most developed system. If twenty somites are present in the embryo, the forebrain is completely closed.